“FiberMate Wood Fiber Panel with Eco-Finish™”, a two-page four-color product sheet, describes this new wood-fiber panel that is manufactured into a high-density fiberboard available in the 3.2mm thickness. FiberMate graphic display board is finished with Eco-Finish™ – a white water-based UV print coating on both sides. FiberMate’s Eco-Finish is designed to provide excellent ink and paint adhesion on both sides of this graphic display board, enabling double-sided printing and other double-sided finishing applications. The FiberMate product sheet describes how FiberMate graphic display board can be recycled in either “wood” or “paper” waste streams depending on local community resources and providing those printing inks and/or mounting or other finishing materials applied to the media also are recyclable. FiberMate with Eco-Finish is CARB (California Air Resource Board) compliant. This new literature piece describes FiberMate’s product availability in 49-inch by 97-inch sheets in the 3.2mm thickness. It also lists any number of applications in which FiberMate can be utilized as the substrate, including the creation of medium-term point-of-purchase displays, interior signage and exhibits/kiosks. FiberMate also can be used in long-term framing applications. Also described are FiberMate fabrication techniques – including finishing with mounted graphics, digital printing, screen printing, and painted designs. Additionally, FiberMate can be cut with a saw and routs extremely well. 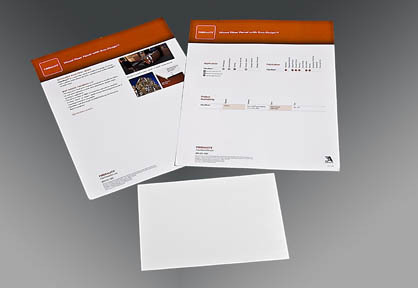 Product samples of FiberMate are available in 5-by-7 inch sheets. samp4fbe4cfab48f9 30 FiberMate™ 3.2mm White/White 5"x7"